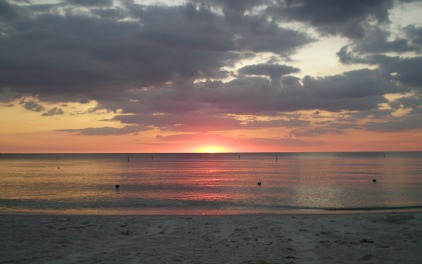 Lovers Key Beach is perfect for those who want to get away from it all and enjoy the beauty of nature. 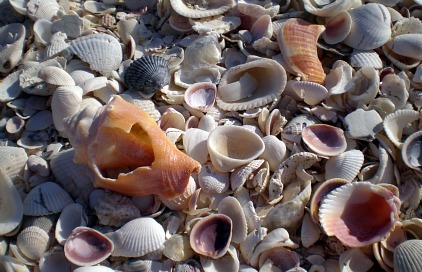 Located in Lovers Key State Park, you will enjoy white-sand beaches with aqua-colored waters, and some of the best shelling around. The park is made up of 4 barrier islands ........ Lovers Key is on the gulf side, then comes Inner Key, Black Island, and Long Key. The islands are between Ft Myers Beach and Bonita Springs Beach and have picnicking, boat ramps, a playground, and an observation area. There are also 8 miles of hiking and biking trails, kayaking, canoeing, and fishing. For those of you who like to look for shells, you won't be disappointed! I can't help myself, I usually grab a souvenir or 2 to add to my collection. Offered through the park service are saltwater fishing and boat tours, guided walks, crafts, activities, and ranger programs. There's a small beach right after you get off the bridge from Ft Myers Beach, with an entrance to the hiking and biking trails. 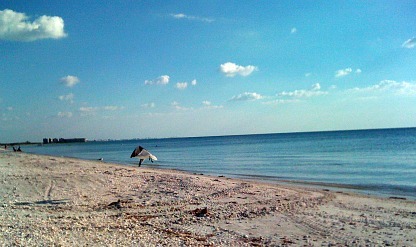 For those who want to swim and suntan, it's better to go a bit further to the southern entrance of Lovers Key Beach. You pay for parking at the entrance to the park and there is a concession stand, restrooms, canoe and kayak rentals, bait, and fishing supplies. Pay attention to when the last tram goes back, I think it was at 4PM the last time we were there........ it's a long walk back! Beach grasses and sparkling sand make the perfect backdrop for a day in the sun. Or, for weddings and parties at the gazebo, which can be reserved year round. One thing you should know about is the stingray shuffle. There can be stingrays in these waters from May to October and if you step on a stingray, you could get stung. By shuffling into the water, your foot would go under the stingray instead. If stung, apply heat and clean the wound, seek medical help if you can't get the barb out. The park has tried to leave the beach in it's natural state as much as possible. And if you can get there by boat, you will be able to find some really wild spots away from everyone. We had to dock our boat just offshore, but it was pretty shallow. We waded in and walked paths along the beach strewn with driftwood and shells. I found a tree that was decorated with shells on all its branches, it was so cool! Lovers Key got it's name because it was accessible only by boat until 1965, it was said that lovers were the only ones who would bother to go there even though fish camps existed there until the 1950's. 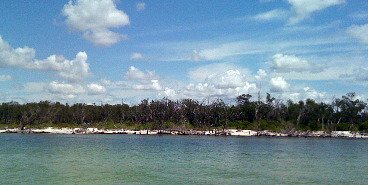 In the 60's and 70's development damaged the islands, so the state bought the islands in 1983 and merged them with an adjacent park to become the Lovers Key Carl E Johnson State Park. Legend has it that Black Island got its name from a pirate named Black Augustus. He had apparently escaped capture and lived on the island till the end of his life. 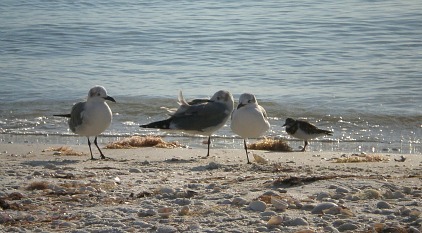 Lovers Key is open 365 days a year and hours are 8AM till Sunset and I hope you will go and check it out. Pets are permitted in designated areas and on a leash.